Hey, you. 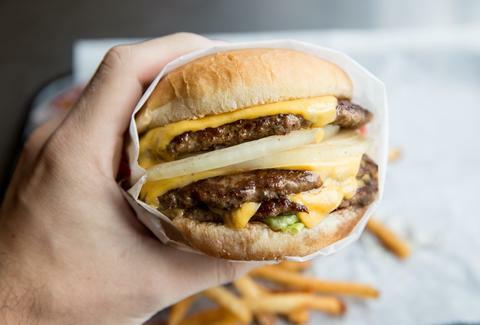 Yes, you with that loaded bacon cheeseburger. Cease shoving it into your mouth and pay attention for a few minutes. Even though you may not want to hear this, science says that meat is pretty bad for you, and really, the medical outcomes of 1.5 million people can't be wrong. Is this horribly depressing? Sure, some of your fondest memories and web-browsing experiences involve meat. But isn't it more depressing to keep your head buried in the sand? Yeah, probably, that's a strategy figuratively used by children and literally used by ostriches to deal with their problems. And ostriches make some pretty tasty burgers. Chili, too. You're joking, right? Please tell me this isn't true. Docs from the world-renowned Mayo Clinic decided to embark on a huge research study -- attractively titled "Is Meat Killing Us?" -- to see how those burgers, steaks, and buckets of fried chicken everyone loves affect people's overall health. For carnivores, the results are pretty depressing. These scientists reviewed six prior studies that were chock-full of data from more than 1.5 million folks (that's a lot of people) and came to the conclusion that meat is the cause of a lot of nasty long-term health consequences. Chief among these is that red and processed meat consumption in particular seems to be associated with people dying earlier, which is really the nastiest long-term health consequence. What do you mean when you say "meat"? Of course, "meat" is a pretty broad category, and it should come as no surprise that red meat is definitely one of the bad guys. Processed meat, such as salami, sausage, and bacon (oof) are also supervillains in the foodie world; generally, the health problems meat consumption causes involve the heart, which isn't shocking. You probably knew that choking down slabs of beef on the regular can clog the arteries. Results were less clear when it comes to white meat and fish, though it does seem there's some benefit to them if they're replacing the massive amount of steak you're eating. It's one thing to say "MEAT BAD" with no context, but is abstaining from bowls of beef tips really that much better for you? Well, the researchers wanted to know the same thing, so they also looked at whether vegetarian diets make you live longer. The answer is basically yes, especially if you plan on making vegetarianism a seriously long-term commitment -- if so, the study says you could be looking at an extra 3.6 years of life, which is nothing to sneeze at. Studies have also shown that vegetarian diets can decrease blood pressure, which is a huge factor for increasing the state of your overall heart health. If meat is so bad, why is beef what's for dinner? It's not hard to see where America goes wrong -- look at our plates. Just look at them! Dr. Craig McDougall, practice lead at ZOOM+, says that the priorities of American eaters (i.e., everyone in America) are out of whack, because too many meats and processed foods are making their way into the average meal. This, of course, is no bueno, and as the above study suggests, may be helping you make an early exit. Why would you want to do that? "The typical American plate is 70% processed foods," explains Dr. McDougall. "Less than 10% of our diet is fresh fruits and vegetables." His recommendation? Healthy starches like beans, corn, rice, and sweet potatoes should take up about half your dinner place, and the other half should be fresh fruits and veggies. Don't see any meat there? Truth is, you don't really need it. But… but what about PROTEIN? One of the concerns about vegetarianism is, of course, lack of adequate protein, but as long as dairy and eggs are part of your diet, you should be good to go. You probably don't need as much as you think you do, anyway. Vegans (those who completely abstain from animal products, including dairy and eggs) have more of a challenge, but as long as a variety of protein sources are chowed down on throughout the day, and they make sure to supplement with B vitamins, everything should be A-OK. So, yes, eating meat every day, all day probably isn't your best bet. "Meat is delicious, though!" you say. Bottom line, then, if you're not up for going full-on vegetarian, make an effort to put more veggies and fruits on your plate, and leave behind your habit of consuming buttloads of meat at every meal. Plant-based diets really aren't that horrible, and making these changes now can bump up the number of years you can careen all over the Earth. And don't forget… your heart, your health, and your mom will thank you for that. Monica Beyer is a health writer who should maybe rethink her love of ground beef. Follow her: @monicabeyer.